Oracle Database optimizer statistics describe details about the database and its objects. The optimizer cost model relies on statistics collected about the objects involved in a query, and the database and host where the query runs. The optimizer collects statistics on different types of database objects and characteristics of the database environment. 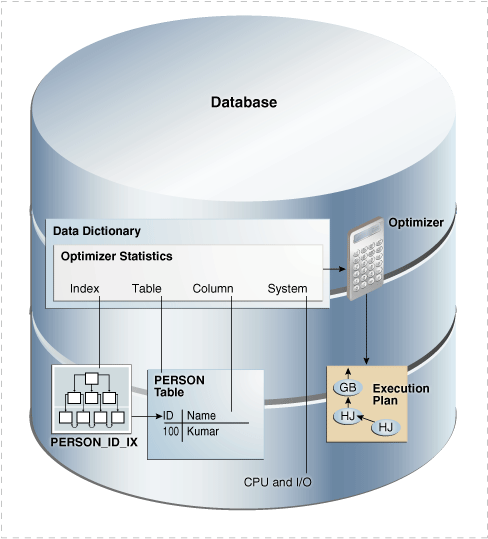 Oracle Database provides several mechanisms to gather statistics. The database collects optimizer statistics at various times and from various sources. The optimizer uses statistics to get an estimate of the number of rows (and number of bytes) retrieved from a table, partition, or index. The optimizer estimates the cost for the access, determines the cost for possible plans, and then picks the execution plan with the lowest cost. As shown in Figure 10-1, the database stores optimizer statistics for tables, columns, indexes, and the system in the data dictionary. You can access these statistics using data dictionary views. The optimizer statistics are different from the performance statistics visible through V$ views. Description of "Figure 10-1 Optimizer Statistics"
In Oracle Database, table statistics include information about rows and blocks. Column statistics track information about column values and data distribution. The index statistics include information about the number of index levels, the number of index blocks, and the relationship between the index and the data blocks. The optimizer uses these statistics to determine the cost of index scans. A global temporary table is a special table that stores intermediate session-private data for a specific duration. The system statistics describe hardware characteristics such as I/O and CPU performance and utilization. The extensible optimizer enables authors of user-defined functions and indexes to create statistics collection, selectivity, and cost functions. The optimizer cost model is extended to integrate information supplied by the user to assess CPU and the I/O cost. The optimizer uses these statistics to determine the cost of table scans and table joins. DBMS_STATS can gather statistics for both permanent and temporary tables. The database uses the row count stored in DBA_TAB_STATISTICS when determining cardinality. The optimizer uses the number of data blocks with the DB_FILE_MULTIBLOCK_READ_COUNT initialization parameter to determine the base table access cost. This example queries some table statistics for the sh.customers table. "Gathering Schema and Table Statistics"
The optimizer can use extended statistics, which are a special type of column statistics. These statistics are useful for informing the optimizer of logical relationships among columns. "About Statistics on Column Groups"
The DBA_IND_STATISTICS view tracks index statistics. For a B-tree index, the index clustering factor measures the physical grouping of rows in relation to an index value, such as last name. This example illustrates how the index clustering factor can influence the cost of table access. The BLEVEL column shows the number of blocks required to go from the root block to a leaf block. A B-tree index has two types of blocks: branch blocks for searching and leaf blocks that store values. See Oracle Database Concepts for a conceptual overview of B-tree indexes. This columns tracks the number of distinct indexed values. If a unique constraint is defined, and if no NOT NULL constraint is defined, then this value equals the number of non-null values. The index clustering factor helps the optimizer decide whether an index scan or full table scan is more efficient for certain queries). A low clustering factor indicates an efficient index scan. A clustering factor that is close to the number of blocks in a table indicates that the rows are physically ordered in the table blocks by the index key. If the database performs a full table scan, then the database tends to retrieve the rows as they are stored on disk sorted by the index key. A clustering factor that is close to the number of rows indicates that the rows are scattered randomly across the database blocks in relation to the index key. If the database performs a full table scan, then the database would not retrieve rows in any sorted order by this index key. The clustering factor is a property of a specific index, not a table. If multiple indexes exist on a table, then the clustering factor for one index might be small while the factor for another index is large. An attempt to reorganize the table to improve the clustering factor for one index may degrade the clustering factor of the other index. This example shows how the optimizer uses the index clustering factor to determine whether using an index is more effective than a full table scan. Create an index on the customers.cust_last_name column. Query the index clustering factor of the newly created index. Create a new copy of the customers table, with rows ordered by cust_last_name. Gather statistics on the customers3 table. Query the number of rows and blocks in the customers3 table . Create an index on the cust_last_name column of customers3. Query the index clustering factor of the customers3_last_name_idx index. The table customers3 has the same data as the original customers table, but the index on customers3 has a much lower clustering factor because the data in the table is ordered by the cust_last_name. The clustering factor is now about 10 times the number of blocks instead of 70 times. Display the cursor for the query. The preceding plan shows that the optimizer did not use the index on the original customers tables. The result set is the same, but the optimizer chooses the index. The plan cost is much less than the cost of the plan used on the original customers table. Query customers with a hint that forces the optimizer to use the index. The preceding plan shows that the cost of using the index on customers is higher than the cost of a full table scan. Thus, using an index does not necessarily improve performance. The index clustering factor is a measure of whether an index scan is more effective than a full table scan. A table contains 9 rows that are stored in 3 data blocks. The col1 column currently stores the values A, B, and C.
A nonunique index named col1_idx exists on col1 for this table. In this example, the index clustering factor for col1_idx is low. The rows that have the same indexed column values for col1 are in the same data blocks in the table. Thus, the cost of using an index range scan to return all rows with value A is low because only one block in the table must be read. In this example, the index clustering factor for col1_idx is higher. The database must read all three blocks in the table to retrieve all rows with the value A in col1. The ON COMMIT clause of CREATE GLOBAL TEMPORARY TABLE indicates whether the table is transaction-specific (DELETE ROWS) or session-specific (PRESERVE ROWS). Thus, a temporary table holds intermediate result sets for the duration of either a transaction or a session. When you create a global temporary table, you create a definition that is visible to all sessions. No physical storage is allocated. When a session first puts data into the table, the database allocates storage space. The data in the temporary table is only visible to the current session. Starting in Oracle Database 12c, you can set the table-level preference GLOBAL_TEMP_TABLE_STATS to make statistics on a global temporary table shared (SHARED) or session-specific (SESSION). DBMS_STATS commits changes to session-specific global temporary tables, but not to transaction-specific global temporary tables. When set to session-specific, you can gather statistics for a global temporary table in one session, and then use the statistics for this session only. Meanwhile, users can continue to maintain a shared version of the statistics. During optimization, the optimizer first checks whether a global temporary table has session-specific statistics. If yes, the optimizer uses them. Otherwise, the optimizer uses shared statistics if they exist. Dictionary views that track statistics show both the shared statistics and the session-specific statistics in the current session. The views are DBA_TAB_STATISTICS, DBA_IND_STATISTICS, DBA_TAB_HISTOGRAMS, and DBA_TAB_COL_STATISTICS (each view has a corresponding USER_ and ALL_ version). The SCOPE column shows whether statistics are session-specific or shared. Other sessions do not share the cursor using the session-specific statistics. Different sessions can share the cursor using shared statistics, as in releases earlier than Oracle Database 12c. The same session can share the cursor using session-specific statistics. Pending statistics are not supported for session-specific statistics. When the GLOBAL_TEMP_TABLE_STATS preference is set to SESSION, by default GATHER_TABLE_STATS immediately invalidates previous cursors compiled in the same session. However, this procedure does not invalidate cursors compiled in other sessions. The preceding program units observe the GLOBAL_TEMP_TABLE_STATS preference. For example, if the table preference is set to SESSION, then SET_TABLE_STATS sets the session statistics, and GATHER_TABLE_STATS preserves all rows in a transaction-specific temporary table. If the table preference is set to SHARED, then SET_TABLE_STATS sets the shared statistics, and GATHER_TABLE_STATS deletes all rows from a transaction-specific temporary table. System statistics enable the query optimizer to more accurately estimate I/O and CPU costs when choosing execution plans. The database does not invalidate previously parsed SQL statements when updating system statistics. The database parses all new SQL statements using new statistics. Statistics types act as interfaces for user-defined functions that influence the choice of execution plan. However, to use a statistics type, the optimizer requires a mechanism to bind the type to a database object such as a column, standalone function, object type, index, indextype, or package. The SQL statement ASSOCIATE STATISTICS allows this binding to occur. Functions for user-defined statistics are relevant for columns that use both standard SQL data types and object types, and for domain indexes. When you associate a statistics type with a column or domain index, the database calls the statistics collection method in the statistics type whenever DBMS_STATS gathers statistics. The DBMS_STATS PL/SQL package collects and manages optimizer statistics. Starting in Oracle Database 12c, the database can gather table statistics automatically during the following types of bulk loads: INSERT INTO ... SELECT into an empty table using a direct path insert, and CREATE TABLE AS SELECT . This package enables you to control what and how statistics are collected, including the degree of parallelism for statistics collection, sampling methods, granularity of statistics collection in partitioned tables, and so on. Do not use the COMPUTE and ESTIMATE clauses of the ANALYZE statement to collect optimizer statistics. These clauses have been deprecated. Instead, use DBMS_STATS. Statistics gathered with the DBMS_STATS package are required for the creation of accurate execution plans. For example, table statistics gathered by DBMS_STATS include the number of rows, number of blocks, and average row length. By default, Oracle Database uses automatic optimizer statistics collection. In this case, the database automatically runs DBMS_STATS to collect optimizer statistics for all schema objects for which statistics are missing or stale. The process eliminates many manual tasks associated with managing the optimizer, and significantly reduces the risks of generating suboptimal execution plans because of missing or stale statistics. You can also update and manage optimizer statistics by manually executing DBMS_STATS. Dynamic statistics augment statistics rather than providing an alternative to them. Dynamic statistics supplement optimizer statistics such as table and index block counts, table and join cardinalities (estimated number of rows), join column statistics, and GROUP BY statistics. This information helps the optimizer improve plans by making better estimates for predicate cardinality. An execution plan is suboptimal because of complex predicates. The query executes many times so that the sampling time is amortized. By default, a parallel insert uses a direct path insert. You can force a direct path insert by using the /*+APPEND*/ hint. Data warehouses typically load large amounts of data into the database. For example, a sales data warehouse might load sales data nightly. When inserting rows into an empty partitioned table, the database gathers global statistics during the insert. While gathering online statistics, the database does not gather index statistics or create histograms. If these statistics are required, then Oracle recommends running DBMS_STATS.GATHER_TABLE_STATS with the options parameter set to GATHER AUTO after the bulk load. In some situations, optimizer statistics gathering does not occur automatically for bulk loads. By default, the database gathers statistics during bulk loads. You can disable the feature at the statement level by using the NO_GATHER_OPTIMIZER_STATISTICS hint, and enable the feature at the statement level by using the GATHER_OPTIMIZER_STATISTICS hint. Gathering statistics during the load avoids an additional table scan to gather table statistics. No user intervention is required to gather statistics after a bulk load. For example, if sales is an empty partitioned table, and if you run INSERT INTO sales SELECT, then the database gathers global statistics for sales. However, the database does not gather partition-level statistics. Assume a different case in which you use extended syntax to insert rows into a particular partition or subpartition, which is empty. The database gathers statistics on the empty partition during the insert. However, the database does not gather global statistics. Assume that you run INSERT INTO sales PARTITION (sales_q4_2000) SELECT. If partition sales_q4_2000 is empty before the insert (other partitions need not be empty), then the database gathers statistics during the insert. Moreover, if the INCREMENTAL preference is enabled for sales, then the database also gathers a synopsis for sales_q4_2000. Statistics are immediately available after the INSERT statement. However, if you roll back the transaction, then the database automatically deletes statistics gathered during the bulk load. "Considerations for Incremental Statistics Maintenance"
The preceding example only gathers missing or stale statistics. The database does not gather table and basic column statistics collected during the bulk load. You can set the table preference options to GATHER AUTO on the tables that you plan to bulk load. In this way, you need not explicitly set the options parameter when running GATHER_TABLE_STATS. It is not empty, and you perform an INSERT INTO ... SELECT. In this case, an OPTIMIZER STATISTICS GATHERING row source appears in the plan, but this row source is only a pass-through. The database does not actually gather optimizer statistics. The DBA_TAB_COL_STATISTICS.NOTES column is set to STATS_ON_LOAD by a bulk load into an empty table. However, subsequent bulk loads into the non-empty table do not reset the NOTES column. One technique for determining whether the database gathered statistics is to query the USER_TAB_MODIFICATIONS.INSERTS column. If the query returns a row indicating the number of rows loaded, then the most recent bulk load did not gather statistics automatically. It is loaded using an INSERT INTO ... SELECT, and neither of the following conditions is true: all columns of the target table are specified, or a subset of the target columns are specified and the unspecified columns have default values. Put differently, the database only gathers statistics automatically for bulk loads when either all columns of the target table are specified, or a subset of the target columns are specified and the unspecified columns have default values. For example, the sales table has only columns c1, c2, c3, and c4. The column c4 does not have a default value. You load sales_copy by executing INSERT /*+ APPEND */ INTO sales_copy SELECT c1, c2, c3 FROM sales. In this case, the database does not gather online statistics for sales_copy. The database would gather statistics if c4 had a default value or if it were included in the SELECT list. It is in an Oracle-owned schema such as SYS. It is one of the following types of tables: nested table, index-organized table (IOT), external table, or global temporary table defined as ON COMMIT DELETE ROWS. It has a PUBLISH preference set to FALSE. It is partitioned, INCREMENTAL is set to true, and partition-extended syntax is not used. For example, assume that you execute DBMS_STATS.SET_TABLE_PREFS(null, 'sales', incremental', 'true'). In this case, the database does not gather statistics for INSERT INTO sales SELECT, even when sales is empty. However, the database does gather statistics automatically for INSERT INTO sales PARTITION (sales_q4_2000) SELECT. It is loaded using a multitable INSERT statement. The optimizer uses several different sources for optimizer statistics. A SQL plan directive is additional information and instructions that the optimizer can use to generate a more optimal plan. Starting in Oracle Database 12c, the optimizer automatically decides whether dynamic statistics are useful and which sample size to use for all SQL statements. In earlier releases, dynamic statistics were called dynamic sampling. At the beginning of optimization, when deciding whether a table is a candidate for dynamic statistics, the optimizer checks for the existence of persistent SQL plan directives on the table. This PL/SQL package is the primary means of gathering optimizer statistics. During SQL compilation, the database can augment the statistics previously gathered by DBMS_STATS. In this stage, the database runs additional queries to obtain more accurate information on how many rows in the tables satisfy the WHERE clause predicates in the SQL statement. During execution, the database can further augment previously gathered statistics. In this stage, Oracle Database collects the number of rows produced by every row source during the execution of a SQL statement. At the end of execution, the optimizer determines whether the estimated number of rows is inaccurate enough to warrant reparsing at the next statement execution. If the cursor is marked for reparsing, then the optimizer uses actual row counts from the previous execution instead of estimates. A SQL profile is a collection of auxiliary statistics on a query. The profile stores these supplemental statistics in the data dictionary. 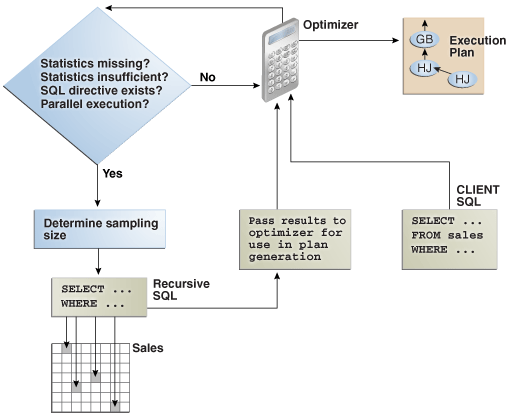 The optimizer uses SQL profiles during optimization to determine the most optimal plan. The database stores optimizer statistics in the data dictionary and updates or replaces them as needed. You can query statistics in data dictionary views. "When the Database Samples Data"
The directive is a “note to self” by the optimizer that it is misestimating cardinalities of certain types of predicates, and also a reminder to DBMS_STATS to gather statistics needed to correct the misestimates in the future. For example, when joining two tables that have a data skew in their join columns, a SQL plan directive can direct the optimizer to use dynamic statistics to obtain a more accurate join cardinality estimate. The database creates SQL plan directives automatically based on information learned during automatic reoptimization. If a cardinality misestimate occurs during SQL execution, then the database creates SQL plan directives. When compiling a SQL statement, if the optimizer sees a directive, then it obeys the directive by gathering additional information. The database automatically creates SQL plan directives. You cannot create them manually. This example shows how the database automatically creates and uses SQL plan directives for SQL statements. The example shows how the database uses a SQL plan directive until the optimizer verifies that an extension exists and the statistics are applicable. For each new directive, the DBA_SQL_PLAN_DIRECTIVES.STATE column shows the value USABLE. This value indicates that the database can use the directive to correct misestimates. The optimizer defines a SQL plan directive on a query expression, for example, filter predicates on two columns being used together. A directive is not tied to a specific SQL statement or SQL ID. For this reason, the optimizer can use directives for statements that are not identical. For example, directives can help the optimizer with queries that use similar patterns, such as queries that are identical except for a select list item. The Notes section of the execution plan indicates the number of SQL plan directives used for a statement. Obtain more information about the directives by querying the DBA_SQL_PLAN_DIRECTIVES and DBA_SQL_PLAN_DIR_OBJECTS views. The optimizer uses dynamic statistics whenever it does not have sufficient statistics corresponding to the directive. For example, the cardinality estimates for a query whose predicate contains a specific pair of columns may be significantly wrong. A SQL plan directive indicates that the whenever a query that contains these columns is parsed, the optimizer needs to use dynamic sampling to avoid a serious cardinality misestimate. Dynamic statistics have some performance overhead. Every time the optimizer hard parses a query to which a dynamic statistics directive applies, the database must perform the extra sampling. Starting in Oracle Database 12c Release 2 (12.2), the database writes statistics from adaptive dynamic sampling to the SQL plan directives store, making them available to other queries. The optimizer examines the query corresponding to the directive. If there is a missing column group, and if the DBMS_STATS preference AUTO_STAT_EXTENSIONS is set to ON (the default is OFF) for the affected table, then the optimizer automatically creates this column group the next time DBMS_STATS gathers statistics on the table. Otherwise, the optimizer does not automatically create the column group. If a column group exists, then the next time this statement executes, the optimizer uses the column group statistics in place of the SQL plan directive when possible (equality predicates, GROUP BY, and so on). In subsequent executions, the optimizer may create additional SQL plan directives to address other problems in the plan, such as join or GROUP BY cardinality misestimates. Currently, the optimizer monitors only column groups. The optimizer does not create an extension on expressions. When the problem that occasioned a directive is solved, either because a better directive exists or because a histogram or extension exists, the DBA_SQL_PLAN_DIRECTIVES.STATE value changes from USABLE to SUPERSEDED. More information about the directive state is exposed in the DBA_SQL_PLAN_DIRECTIVES.NOTES column. The database initially creates directives in the shared pool. The database periodically writes the directives to the SYSAUX tablespace. The database automatically purges any SQL plan directive that is not used after the specified number of weeks (SPD_RETENTION_WEEKS), which is 53 by default. You plan to run queries against the sh schema, and you have privileges on this schema and on data dictionary and V$ views. The gather_plan_statistics hint shows the actual number of rows returned from each operation in the plan. Thus, you can compare the optimizer estimates with the actual number of rows returned. Query the plan for the preceding query. The actual number of rows (A-Rows) returned by each operation in the plan varies greatly from the estimates (E-Rows). This statement is a candidate for automatic reoptimization. Check whether the customers query can be reoptimized. The IS_REOPTIMIZABLE column is marked Y, so the database will perform a hard parse of the customers query on the next execution. The optimizer uses the execution statistics from this initial execution to determine the plan. The database persists the information learned from reoptimization as a SQL plan directive. Display the directives for the sh schema. Initially, the database stores SQL plan directives in memory, and then writes them to disk every 15 minutes. Thus, the preceding example calls DBMS_SPD.FLUSH_SQL_PLAN_DIRECTIVE to force the database to write the directives to the SYSAUX tablespace. Monitor directives using the views DBA_SQL_PLAN_DIRECTIVES and DBA_SQL_PLAN_DIR_OBJECTS. Three entries appear in the views, one for the customers table itself, and one for each of the correlated columns. Because the customers query has the IS_REOPTIMIZABLE value of Y, if you reexecute the statement, then the database will hard parse it again, and then generate a plan based on the previous execution statistics. Query the customers table again. Query the plan in the cursor. The Note section indicates that the database used reoptimization for this statement. The estimated number of rows (E-Rows) is now correct. The SQL plan directive has not been used yet. Query the cursors for the customers query. A new plan exists for the customers query, and also a new child cursor. Confirm that a SQL plan directive exists and is usable for other statements. The Note section of the plan shows that the optimizer used the SQL directive for this statement, and also used dynamic statistics. At this point, the directive changes its status to SUPERSEDED. Subsequent compilations use the statistics instead of the directive. This example assumes you have already followed the steps in "How the Optimizer Uses SQL Plan Directives: Example". Gather statistics for the sh.customers table. Check whether an extension exists on the customers table. The preceding output indicates that a column group extension exists on the cust_state_province and country_id columns. Query the state of the SQL plan directive. Example 10-6 queries the data dictionary for information about the directive. Although column group statistics exist, the directive has a state of USABLE because the database has not yet recompiled the statement. During the next compilation, the optimizer verifies that the statistics are applicable. If they are applicable, then the status of the directive changes to SUPERSEDED. Subsequent compilations use the statistics instead of the directive. Example 10-7 shows the execution plan (sample output included). The Note section shows that the optimizer used the directive and not the extended statistics. During the compilation, the database verified the extended statistics. Example 10-8 queries the data dictionary for information about the directive. The state of the directive, which has changed to SUPERSEDED, indicates that the corresponding column or groups have an extension or histogram, or that another SQL plan directive exists that can be used for the directive. Query the sh.customers table again, using a slightly different form of the statement. If the cursor is in the shared SQL area, then the database typically shares the cursor. To force a reparse, this step changes the SQL text slightly by adding a comment. Example 10-9 shows the execution plan (sample output included). The absence of a Note shows that the optimizer used the extended statistics instead of the SQL plan directive. If the directive is not used for 53 weeks, then the database automatically purges it. Automatic dynamic statistics are enabled when the OPTIMIZER_DYNAMIC_SAMPLING initialization parameter is not set to 0. By default, the dynamic statistics level is set to 2. The SQL statement uses parallel execution. A SQL plan directive exists. The following diagram illustrates the process of gathering dynamic statistics. Description of "Figure 10-2 Dynamic Statistics"
"Configuring Options for Dynamic Statistics"
For each directive, the optimizer registers a statistics expression that the optimizer computes when determining the cardinality of a predicate involving the table. In Figure 10-2, the database issues a recursive SQL statement to scan a small random sample of the table blocks. The database applies the relevant single-table predicates and joins to estimate predicate cardinalities. The database persists the results of dynamic statistics as sharable statistics. The database can share the results during the SQL compilation of one query with recompilations of the same query. The database can also reuse the results for queries that have the same patterns.